The term ‘unplugged wedding’ has been around for a while now. In an era of 24-hour connectivity, where nearly everyone owns a smart phone and ‘likes’, ‘tweets’ and ‘shares’ are part of everyday life, we ask is there a place for digital devices at weddings? An unplugged wedding is where the Bride and Groom ask their guests to put away their phones and cameras and not take pictures during the ceremony, sometimes even the reception. So, why are people banning technology at their wedding? Many Brides who have opted for an unplugged wedding say the main reason was that they wanted guests to connect with them on their wedding day, experience it with them, not through a camera lens. 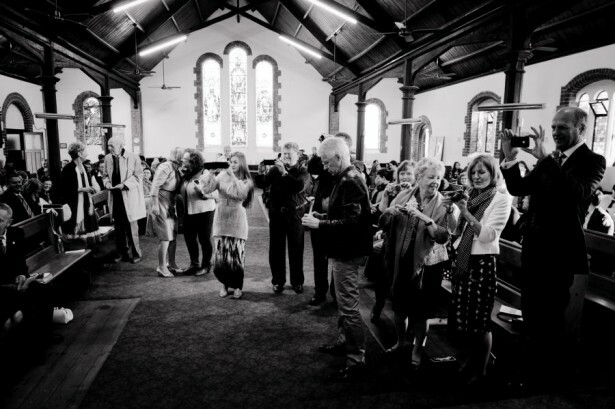 There is nothing worse than walking down the aisle to be faced with a sea of cameras and mobile phones snapping away. You want to see the reaction and emotion on your guests’ faces as you first enter the ceremony. An unplugged wedding can also prevent your guests’ view being blocked by the over-zealous amateur filming in front of them. Another reason is that couples want the first photos that go online to be professional images. By allowing phones at your wedding you run the risk of people sharing parts of your day on social media, before you have even had chance to view the pictures. I once heard about a bride who was getting ready for her big day and one of her bridesmaids posted a photo of her in her dress before she had even arrived at the ceremony! Guests please check with the bridal couple and make sure that it is okay to share pictures on social media. Sometimes people prefer to keep things private. The other major benefit of an unplugged wedding is that it allows the professional photographer to do their job and get the best photos possible. Your photographer is there to capture the special moments of your day. That loving glance at your new husband; the candid shots of your guests laughing. or even crying, as you say your vows. A wedding is full of moments that will be gone forever unless your photographer can treasure those memories through their images. When guests bring their cameras and phones, the professional photos can end up as shots of people either looking at their screen or taking photos. You want to capture guests’ happy, smiling faces, not their face behind a camera lens. If you allow guest photographers, people may get in the way of your professional photographer and even ruin those perfect shots. Flash from a guest photographer’s camera is a real problem and even the best pro can do nothing to remove it from the image. During formal shots eyes tend to wander and people don’t look at the professional photographer because there are too many cameras snapping away at the same time. The main risk of planning an unplugged wedding is that you may offend some guests. However, if you advise them well in advance and remind them before the ceremony, they should respect your wishes. They are there because you invited them to celebrate your day with you. There are lots of funny or romantic ways to request that guests turn off their devices which we will explore in a later post. Remember it is your wedding and if getting quality shots that capture the emotion of your day is more important than offending a few guests, then maybe an unplugged wedding is for you. Will you be having an unplugged wedding? What role do you want digital devices to play at your wedding?